Ready! Set! Go! provides a proprietary blend of natural fruits and plant extracts to support normal elimination for children with occasional constipation. While there is no daily recommended value (DRV) for dietary fiber, the American Heart Association recommends children consume between 19 g and 31 g per day depending on age. The lack of adequate dietary fiber intake can lead to many digestive problems, such as occasional constipation, gas and bloating. Occasional constipation is a common condition, caused in part by poor diet and lifestyle. The prevalence of refined sugars and carbohydrates and the low presence of fiber in the Western diet has been linked to the slowing of bowel transit time and the alteration of the colon environment. Dietary fiber, which is mostly obtained from plant foods, consists of the indigestible portion of the plant while the sugars, starches and vitamins are broken down into nutrients and absorbed by the intestines. These cell walls of plants are not digested and become the bulk or roughage component of the stool, which help maintain bowel health and regularity. Ready! Set! Go! 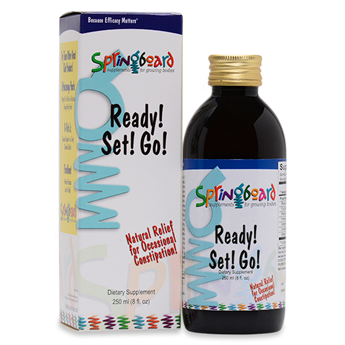 is a blend of all-natural fruits and plant extracts for children with occasional constipation. The ingredients in this blend, which include prunes, psyllium husks, and ginger, have been used historically for the relief of occasional constipation and to soothe an achy stomach. Ready! Set! Go! has a pleasant flavor for easy compliance.